Inside a large estate, the big villa in Tuscany enjoys a great panoramic view and a garden, completely fenced, with swimming pool. The interiors are well maintained and offer a pleasant and comfortable stay. Pleasant evenings await under the big veranda with garden furniture. Its location is ideal for holidays in complete freedom with the possibility of a horse walks starting directly from the Villa. 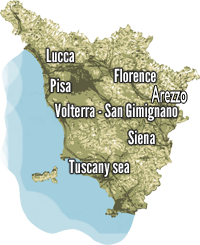 The central location allows easy access to the Tyrrhenian coast and most beautiful tuscany towns.